This is really simple to do and takes no special tools. 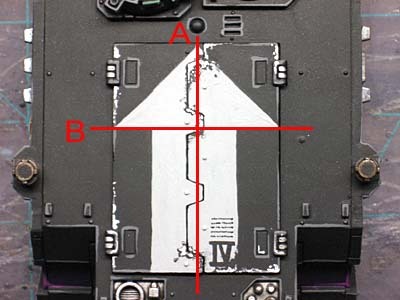 All you need to do is either imagine or simply draw a line down the center of the top hatch (A). Then draw a horizontal line (B) where you want the side points of the arrow head to be. Then connect the points across the top. You can make the width of the arrow anything you want, but I just divided the distance from the middle to the sides of the hatch equally on each side and used that. It seemed to be the right width overall. Paint and weather to your liking and you're all set. UPDATE: Since this post is fairly old, I decided to go back and add a few more links to it to expand on some of the topics covered here. Geometry, making life easier one rhino at a time! Very nice. The lettering in the lower right is a nice touch also. 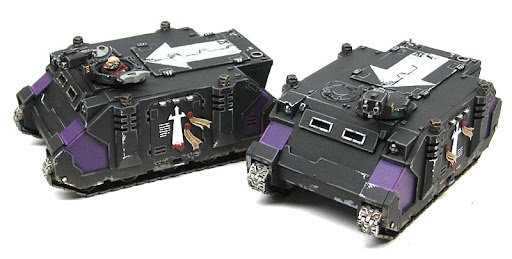 Thanks guys, it's the simple details like this that really make models stand out and sometimes I think people don't realize just how easy they are to add to your army. Anon: It's a real light grey that's opaque. Any color will work really. If it not opaque, you'll just need a few coats to get it there. Make sure to try and not leave many brush strokes though, it will take away from the illusion of it being painted on the actaul vehicle.